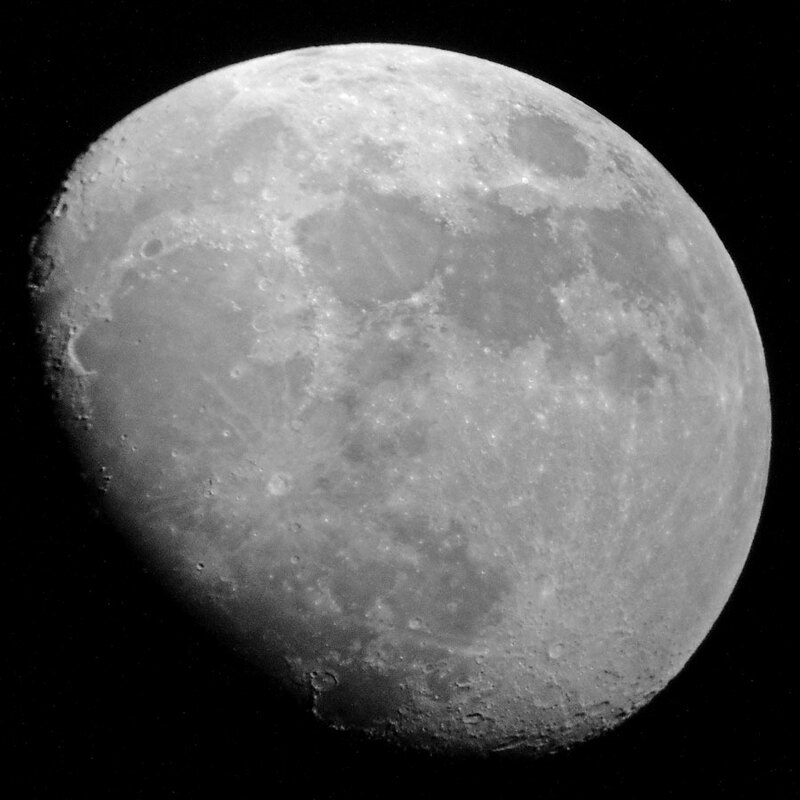 On this page I present photos of the moon that I took from 22-28 February 2018 and that I edited afterwards. 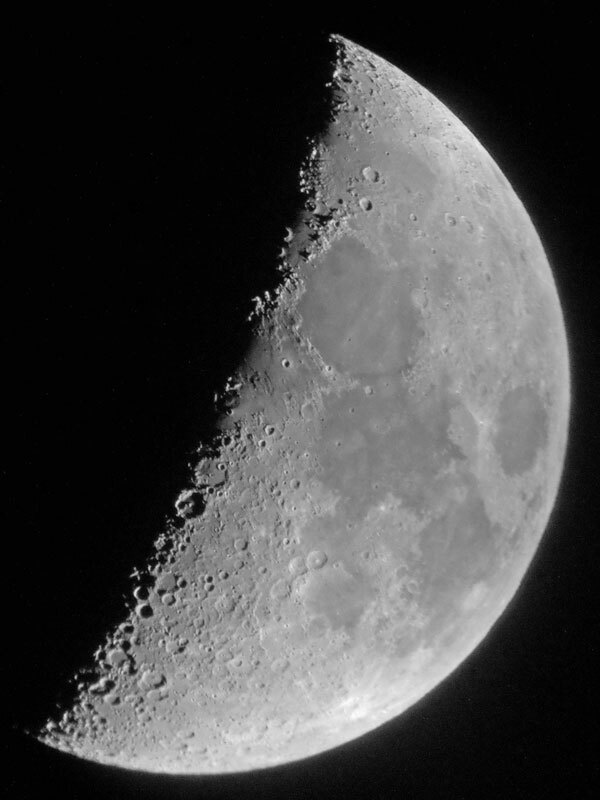 I used my 32 mm DigiScope eyepiece and a 24 mm WA eyepiece. I used my Sky-Watcher Skymax-102-OTA and my new Sky-Watcher Skymax-127 OTA telescopes. The following photos are mirrored so that they correspond to the normal visual impression. I used the Ricoh GR camera with the 1:50 method, fixed the Leica M to the eyepiece (and also connected it via T-mount to the tube, no samples here), and finally screwed the Leica X Vario firmly to the eyepiece. However, I do not show photos taken with the Leica M, because I struggled with technical problems (blurry photos due to shutter shake and shake from pressing the release button/cable release button). 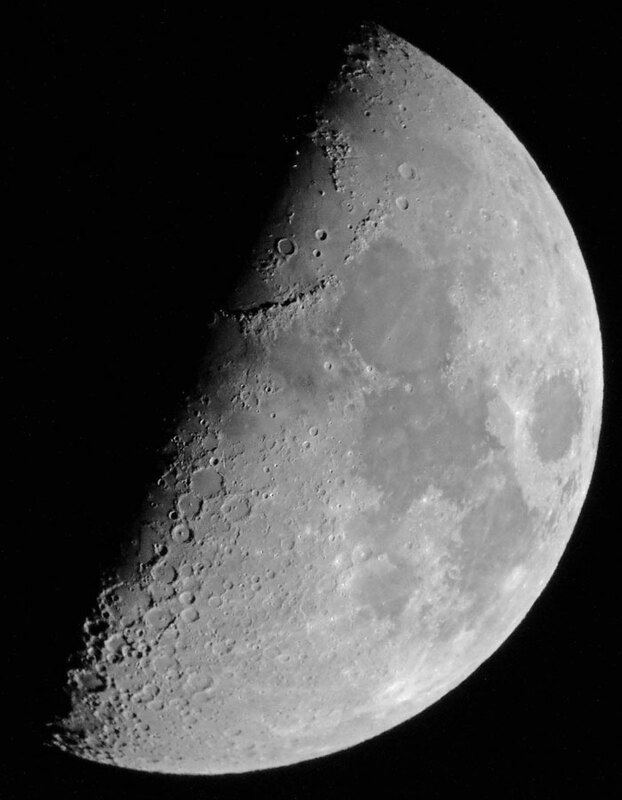 On February 22, 2018, one das before Half Moon, I started with my moon photos activities. 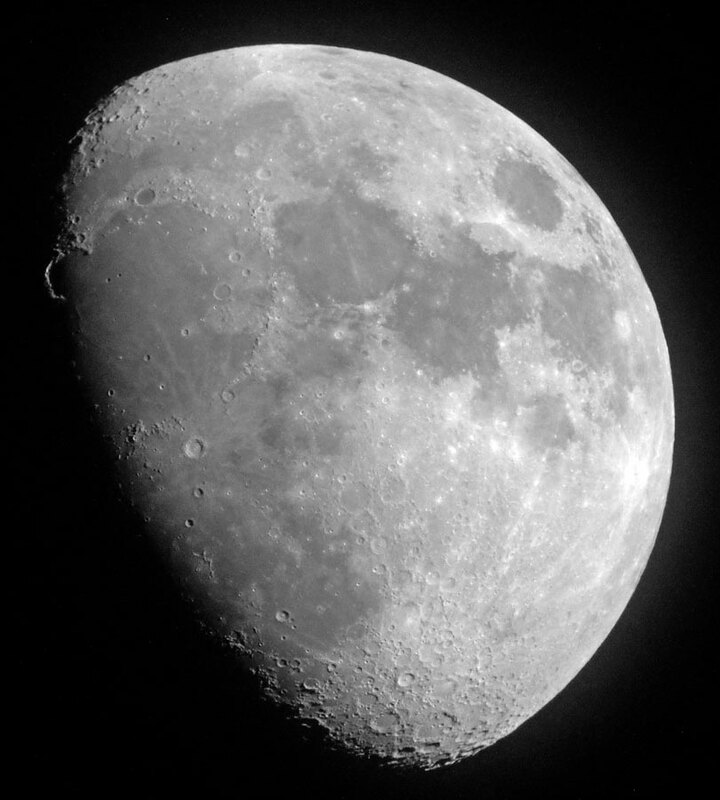 The next evening, that is on February 23, 2018, Aldebaran was covered by the moon in the early evening for an hour. 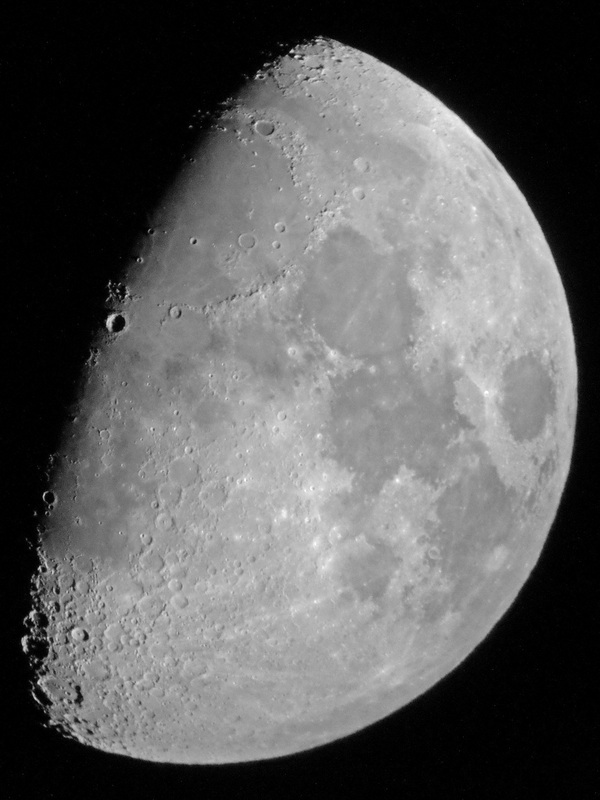 I present the corresponding photos on page Moon Covers Aldebaran 2018. 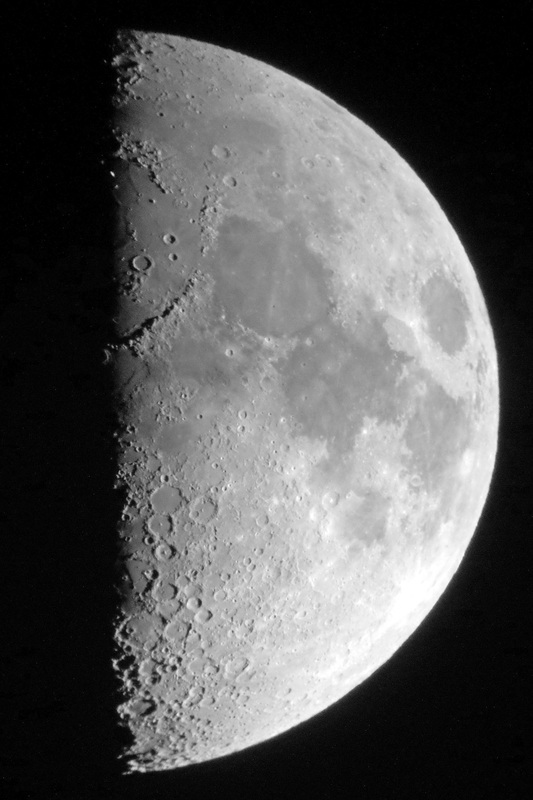 Since the exact Half Moon was shortly after 9 a.m., Half Moon was already slightly exceeded at the time of the photos. On the last day, February 28, 2018, it was two nights before Full Moon (March 2, 2018), but the moon already looked quite full. 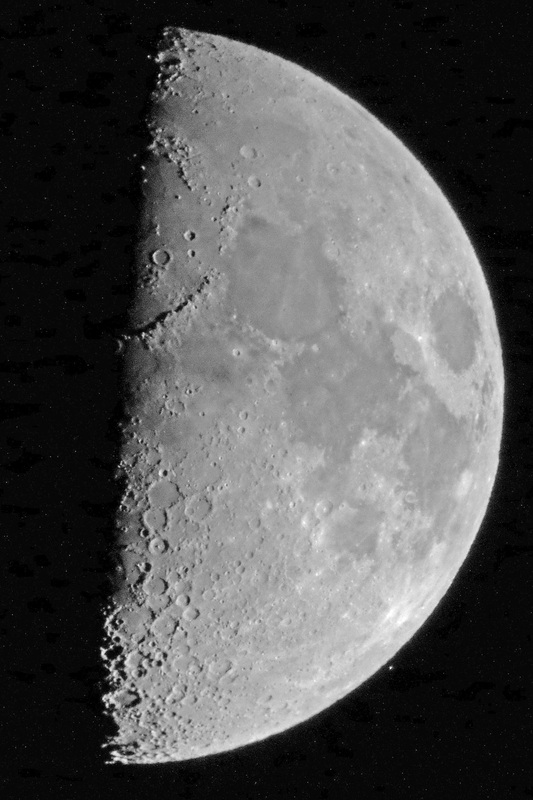 The following photos of the moon were taken on February 22, 2018, one day before Half Moon. 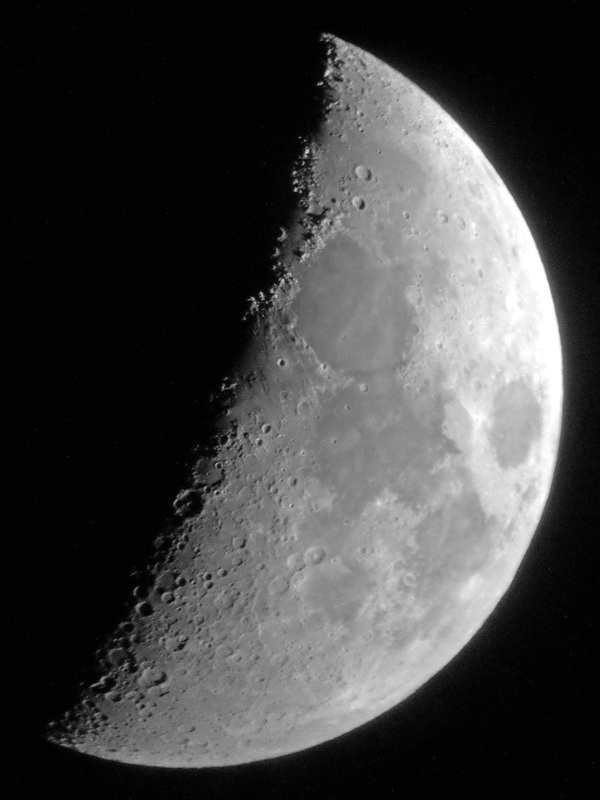 They were taken using the 1:50 method, that is, with the camera attached to the eyepiece. In this case it was a Ricoh GR (28 mm equivalent). I used ISO 1600 and underexposed to avoid blowing the highlights. 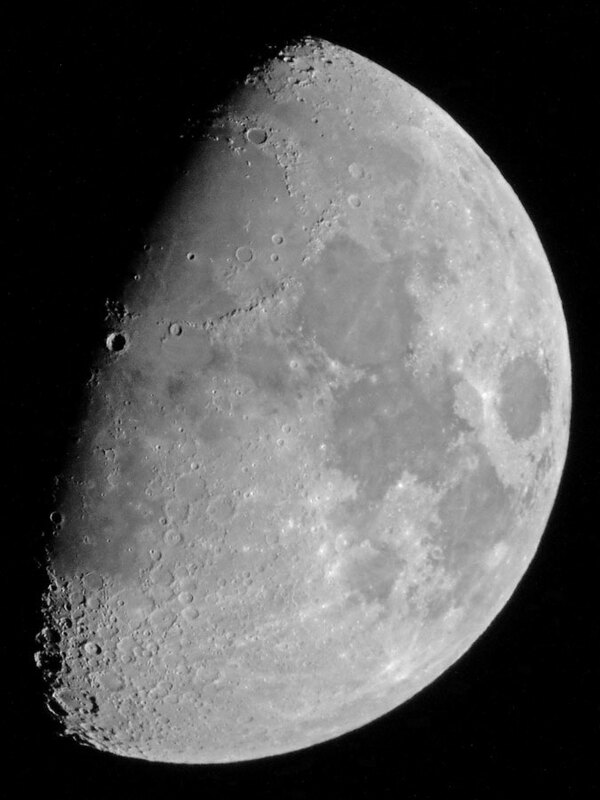 I used the Sky-Watcher Skymax-127 OTA and a 32 mm eyepiece. 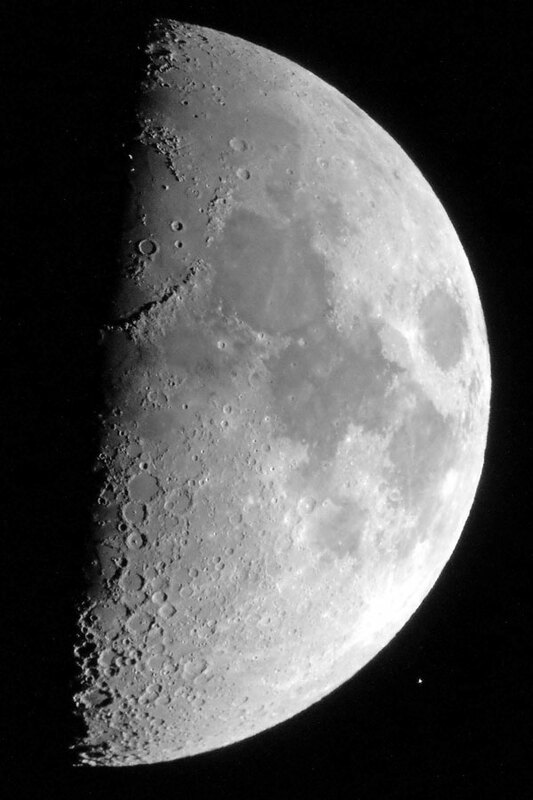 The following photos of the moon were taken on February 23, 2018 (day of the Aldebaran covering, Half Moon). 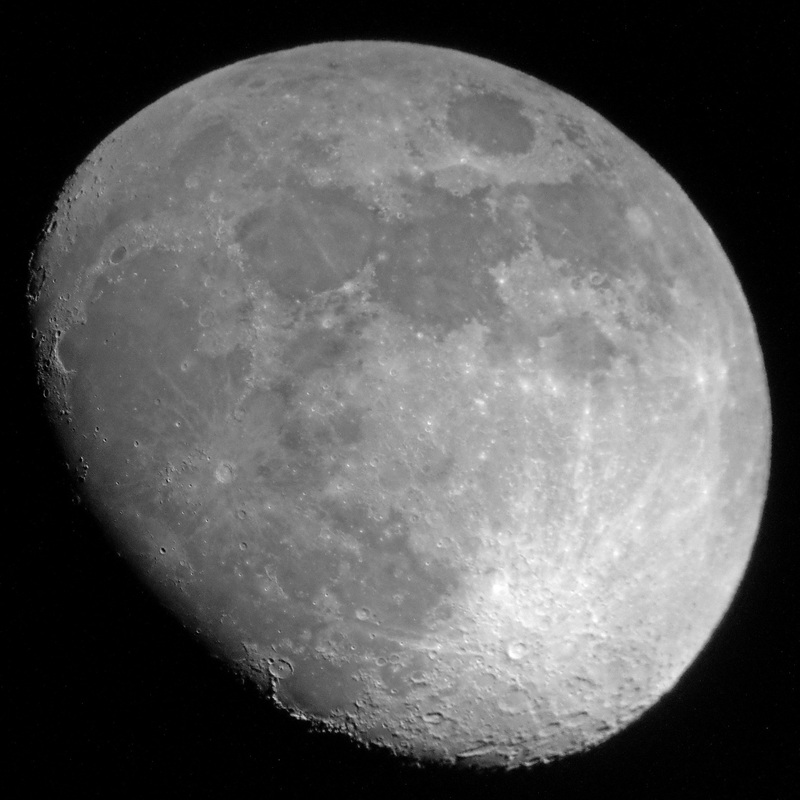 They were taken using the 1:50 method, that is, with the Ricoh GR attached to the eyepiece. I used ISO 1600 and underexposed to avoid blowing the highlights. I used the Sky-Watcher Skymax-102 OTA a 24 mm WA eyepiece, as well as the Skymax-127 OTA with a 32 mm and a 24 mm WA eyepiece. I had the Leica M mounted fix to the 32 mm eyepiece, the photos of which I do not present here; again, I used the Ricoh GR held to the 24 mm eyepiece. 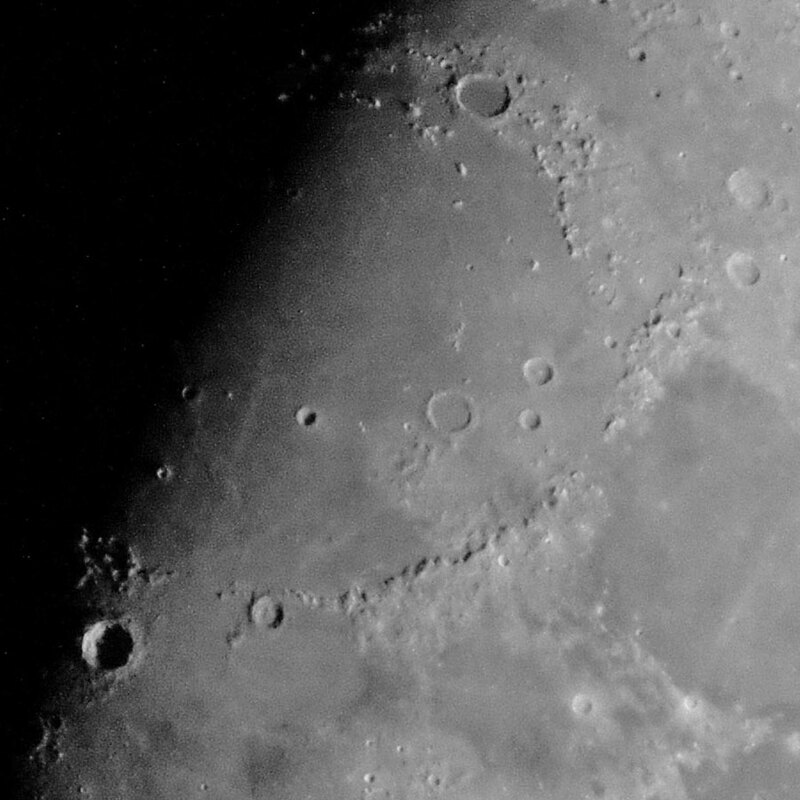 The special thing about the photos taken on this day was that the crater Plato at the terminator (shadow border) in the North was particularly good to see (see below). 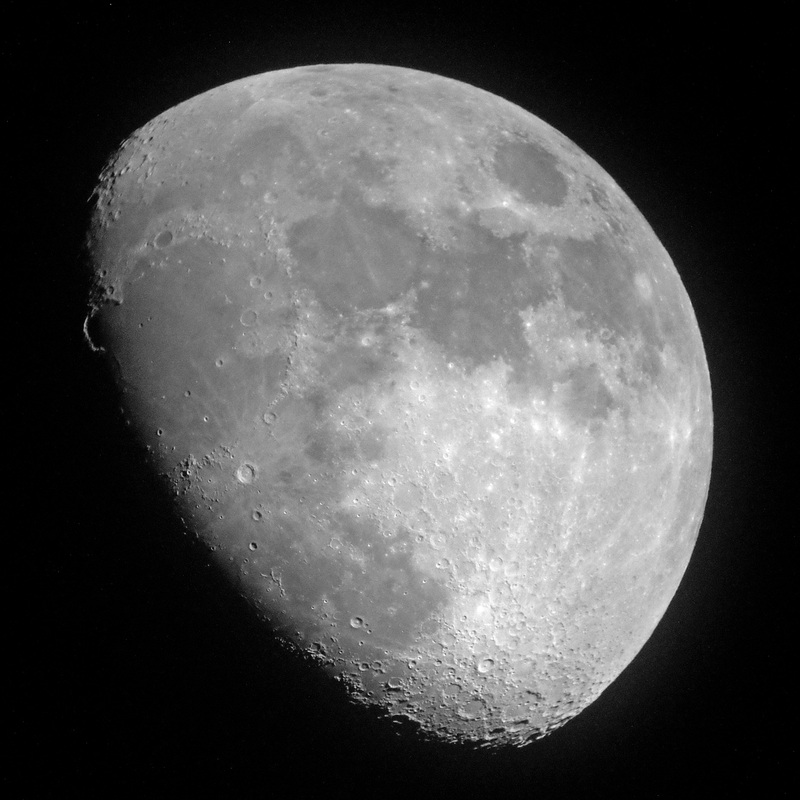 The following photos were taken with the Skymax-127 and the Ricoh GR held to a 24 mm eyepiece. You can see that the magnification is slightly higher due to the slightly longer focal length of the Skymax-127. 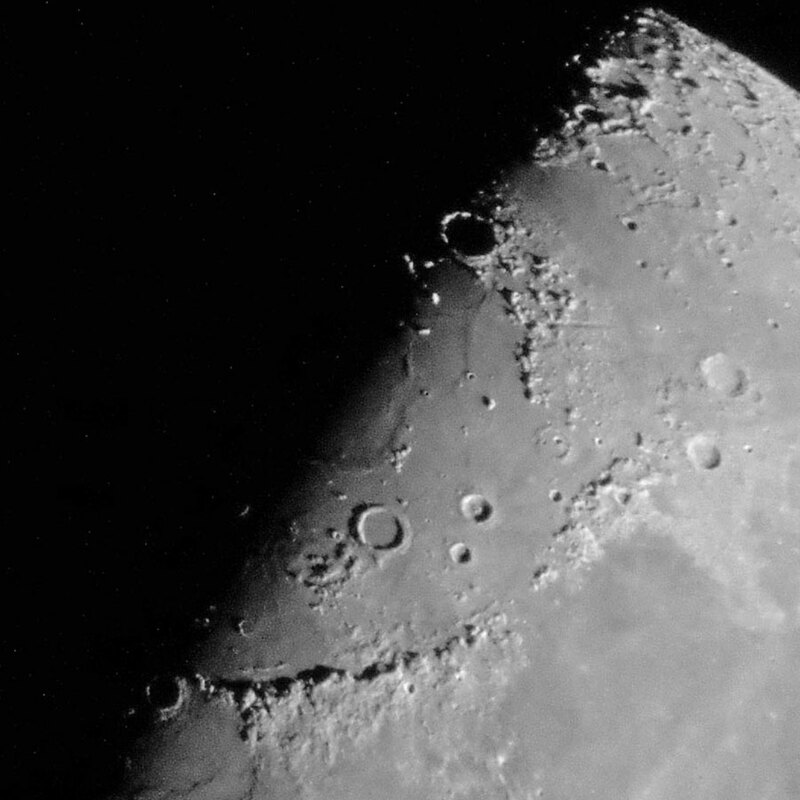 The crater Plato was illuminated by the sun on February 23, 2018. 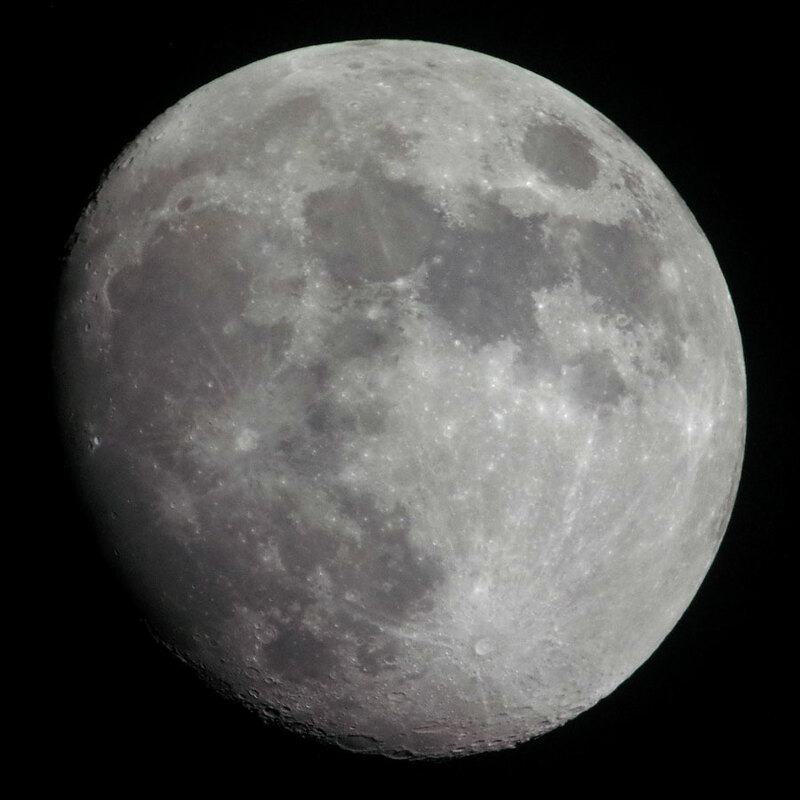 The following photos of the moon were taken on February 24, 2018. 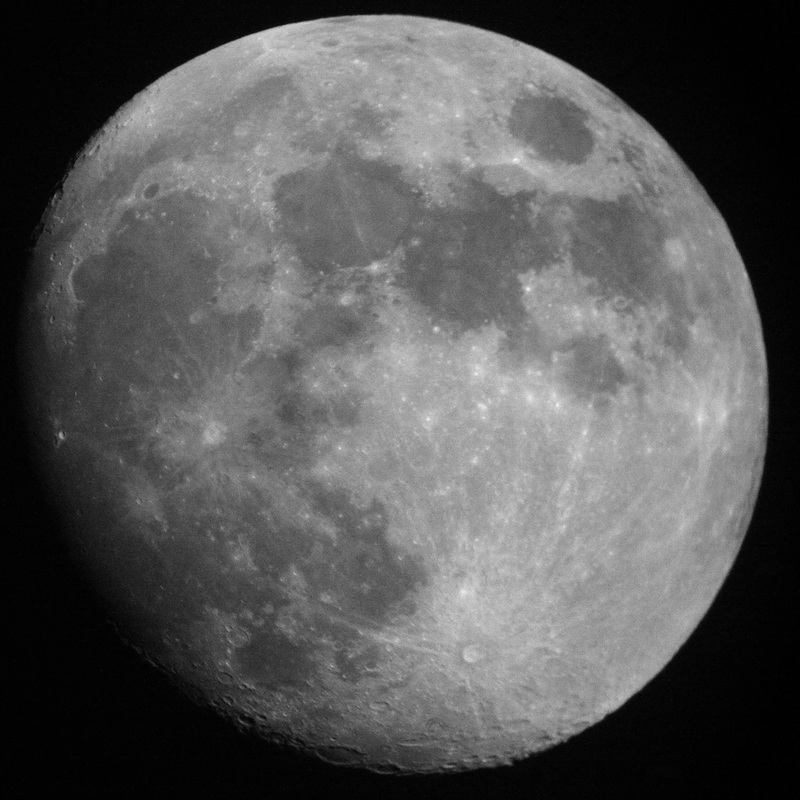 They were taken using the 1:50 method, that is, with the Ricoh GR held to the eyepiece. I used ISO 1600 and underexposed to avoid blowing the highlights. 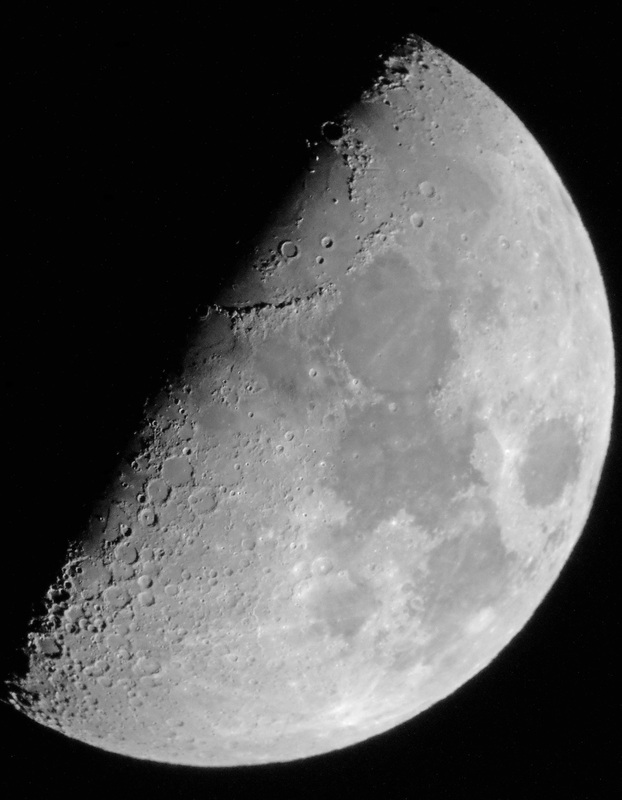 I used the Sky-Watcher Skymax-102 OTA with a 24 mm WA eyepiece. 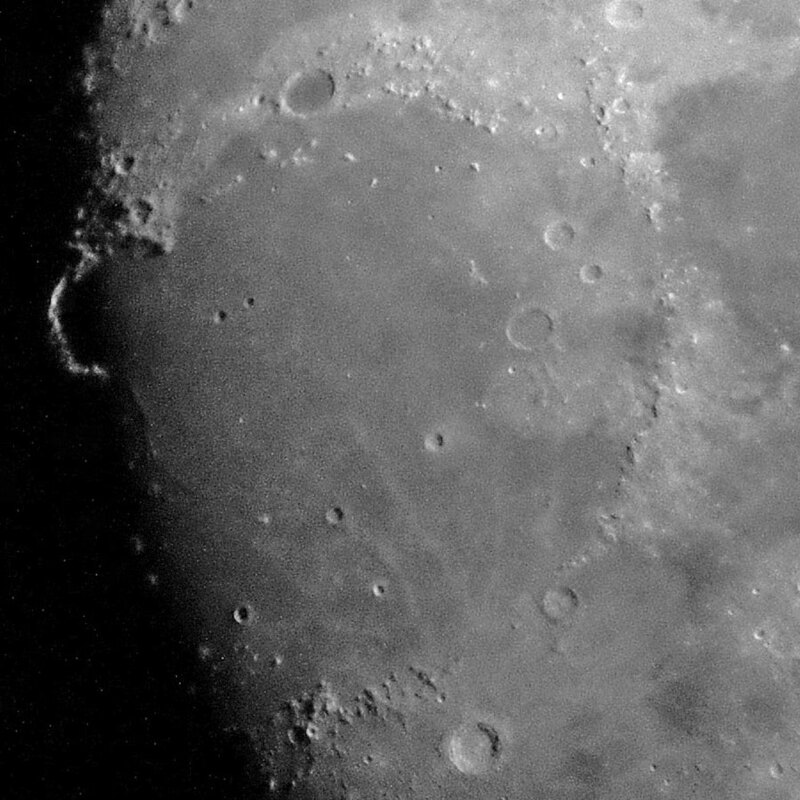 This day, the crater Copernicus appeared very nicely in the center at the terminator. 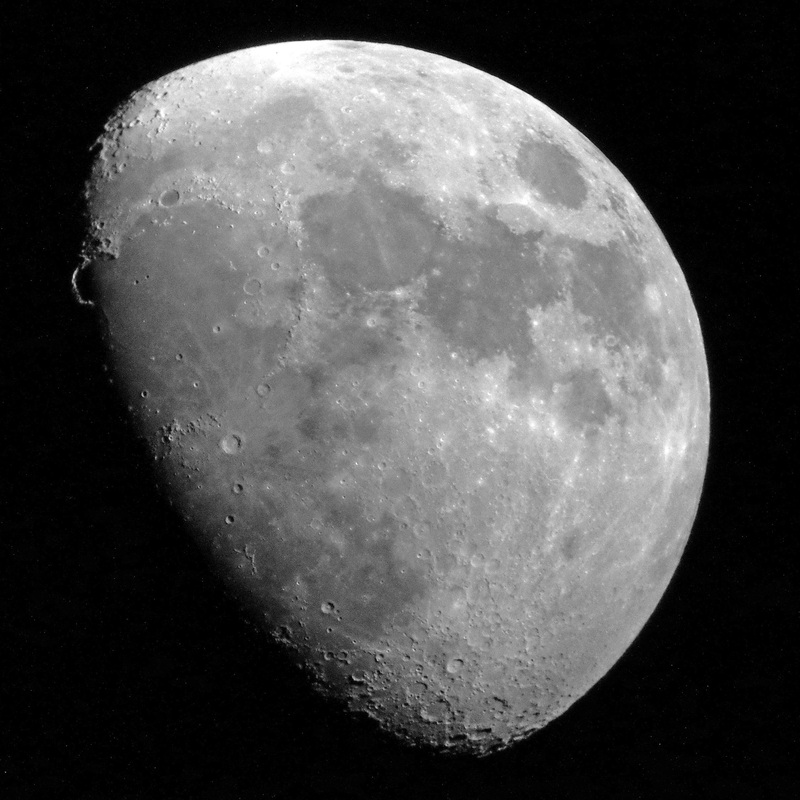 The following photos of the moon were taken on February 25, 2018. 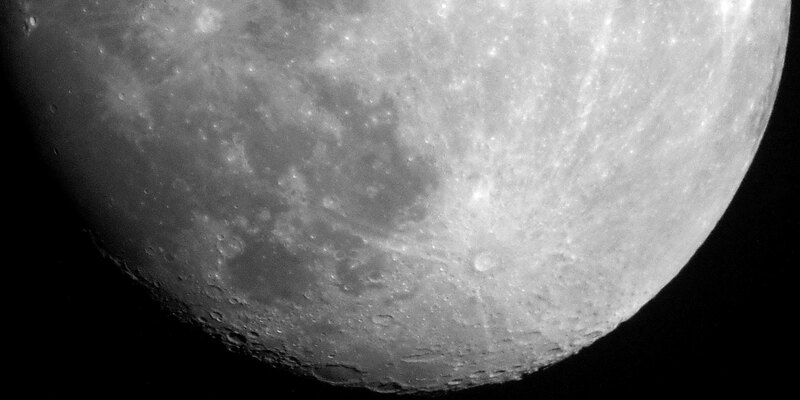 They were taken using the 1:50 method, that is, with the Ricoh GR held to the eyepiece. I used ISO 1600 and underexposed to avoid blowing the highlights. 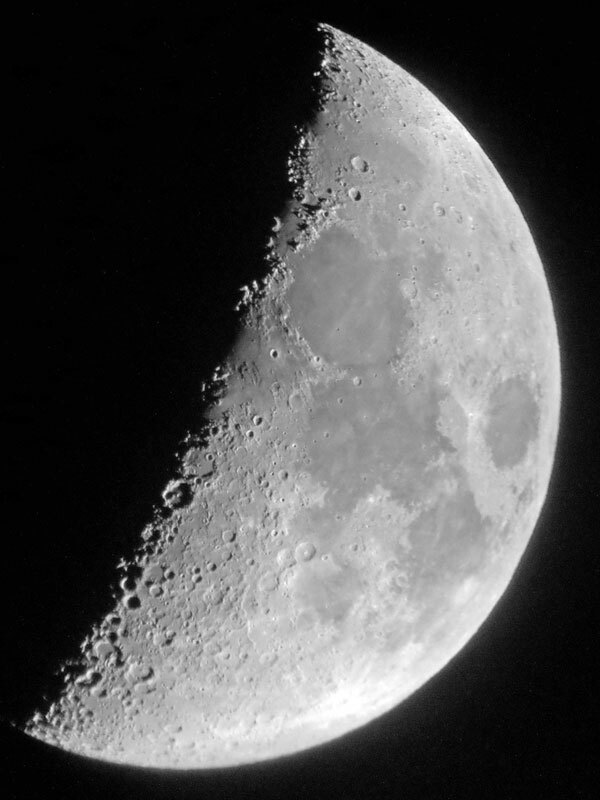 I used the Sky-Watcher Skymax-102 OTA with a 24 mm WA eyepiece. This day, the Jura mountains looked very nicely in the North at the terminator. 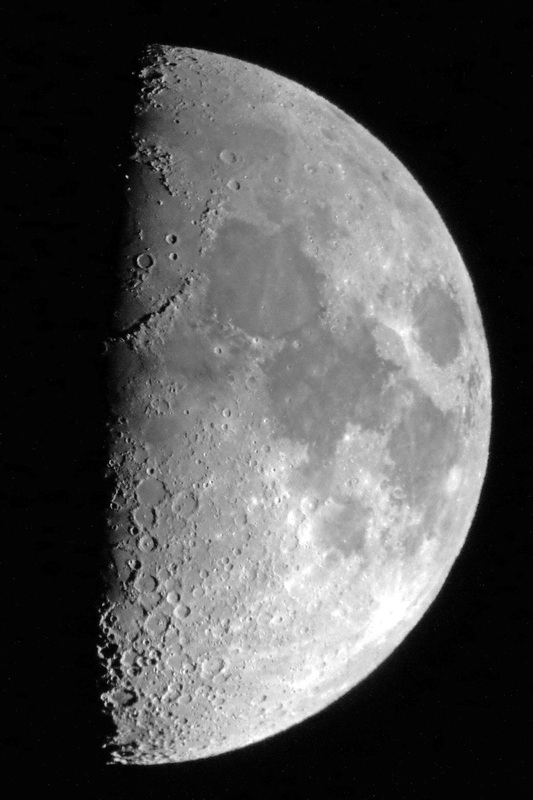 The following photos of the moon were taken on February 26, 2018. They were taken using the 1:50 method, that is, with the Ricoh GR held to the eyepiece. I used ISO 1600 and underexposed to avoid blowing the highlights. I used the Sky-Watcher Skymax-102 OTA with a 24 mm WA eyepiece. 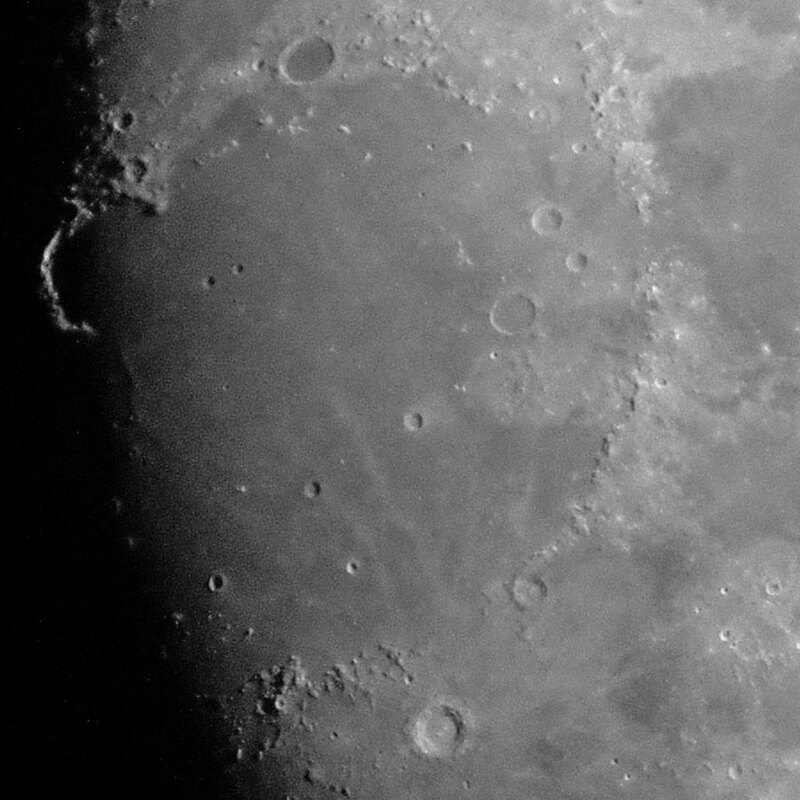 Especially on the left photo, you can see in the south the Mare Humorum and the crater Gassendi. Two sections from the left photo above. 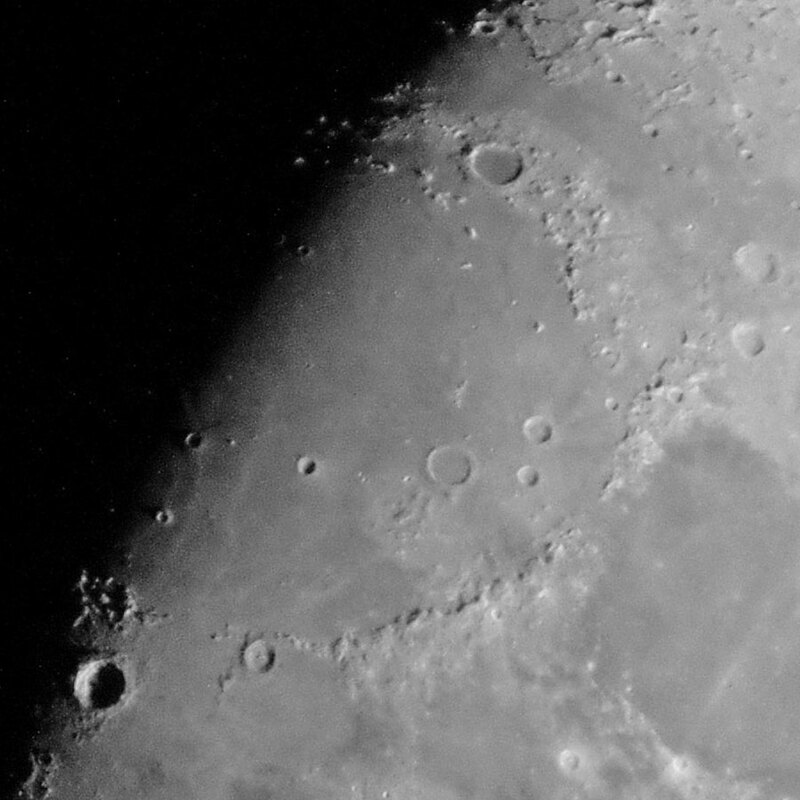 The left one has been made lighter and shows roughly the moon section from the day before with the Jura mountains and the craters Plato (top) and Copernicus (bottom). 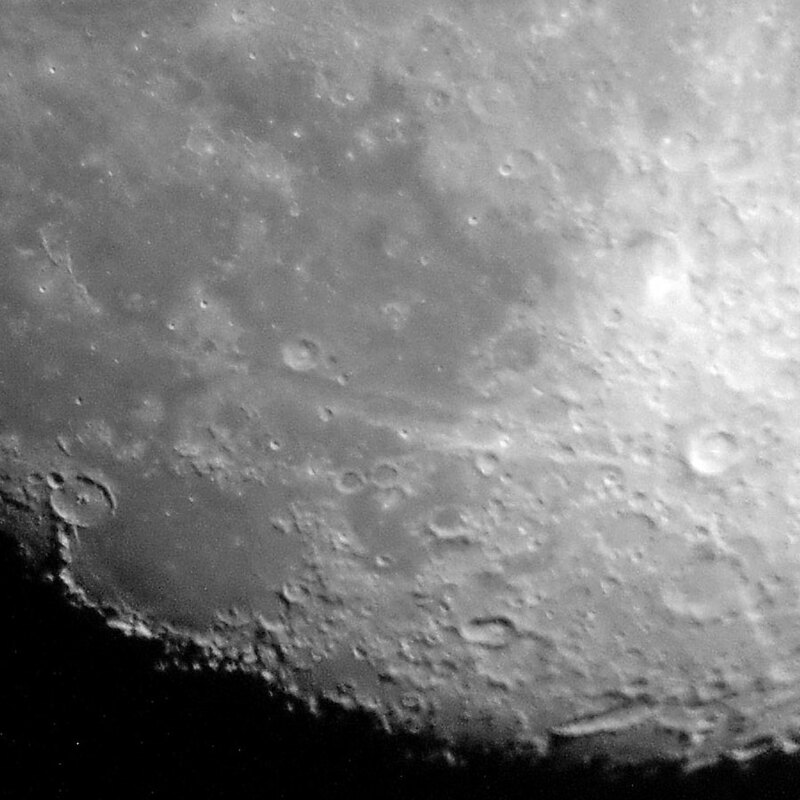 The second one shows Mare Humorum at the top left and the crater Gassendi; you can also see Tycho and rays emanating from it on the right side. Lighting changes from one day to the next around the Jura mountains (February 25, 2018 to the left, February 26, 2018 to the right. 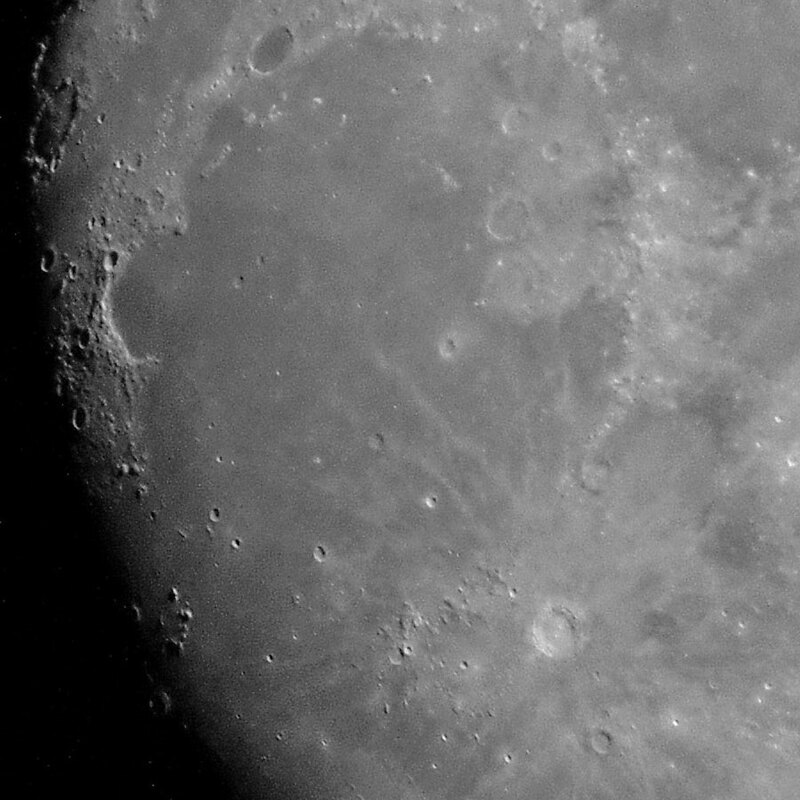 The following photos of the moon were taken on February 27, 2018. They were taken with the Ricoh GR using the 1:50 method and the Leica M (Typ 240) using the projection method. I used ISO 1600 and underexposed to avoid blowing the highlights. 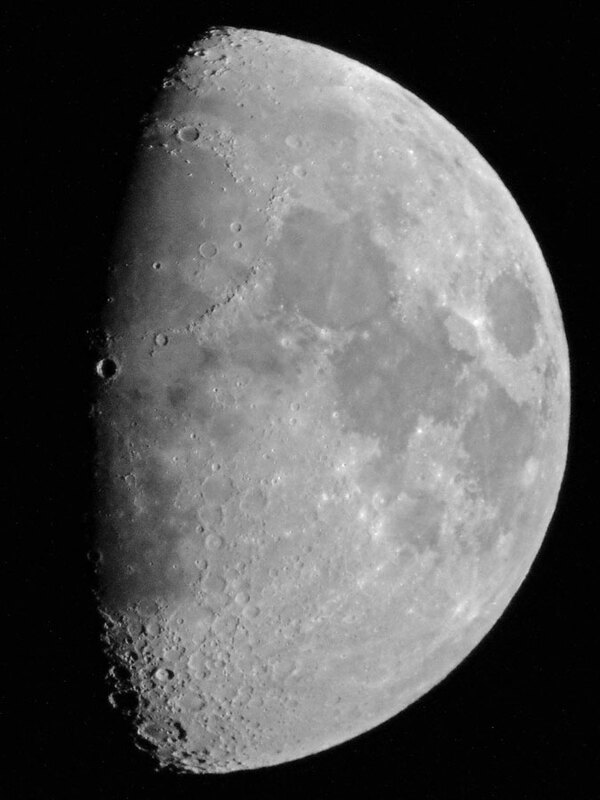 I used the Sky-Watcher Skymax-102 OTA with a 24 mm WA and a 32 mm eyepiece. 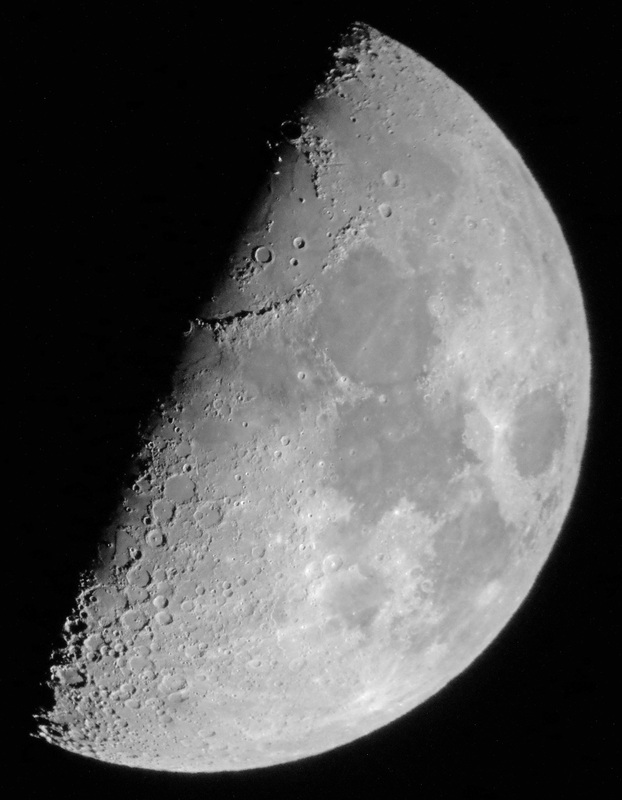 Southern part of the moon, section from the photo above to the right. 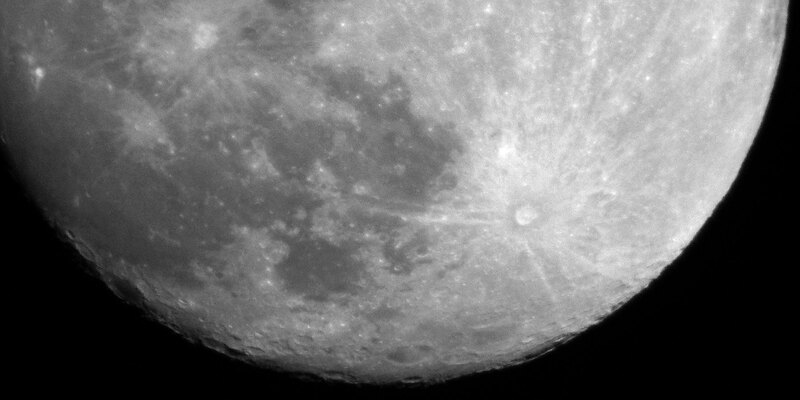 Most prominent is the crater Tycho with rays emanating from it. 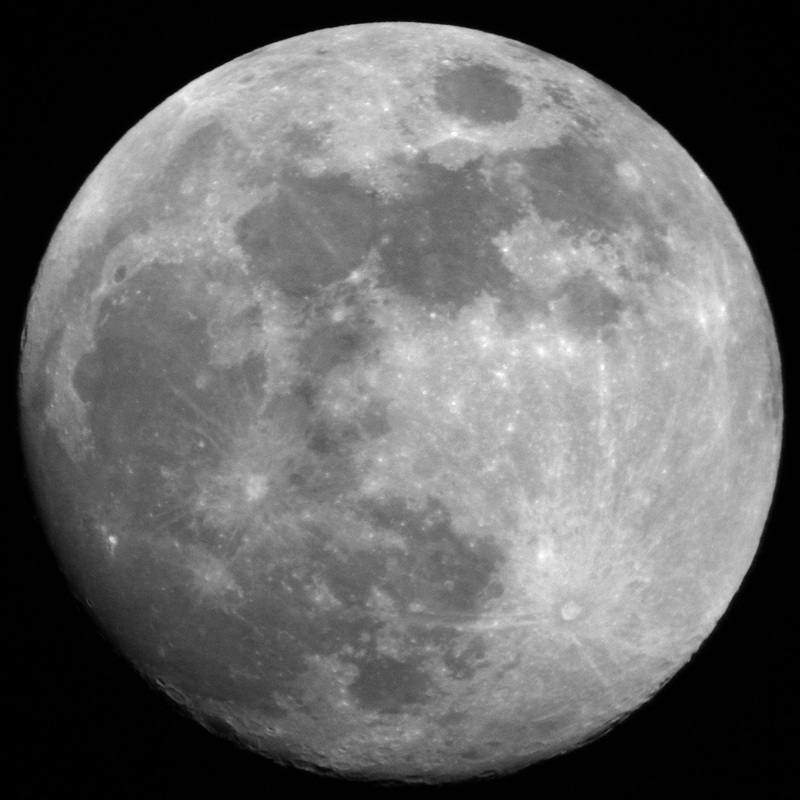 The following photos of the moon were taken on February 28, 2018. They were taken with the Leica X Vario (36 - 50 mm equiv.) using the projection method. I used ISO 1600 and underexposed to avoid blowing the highlights. 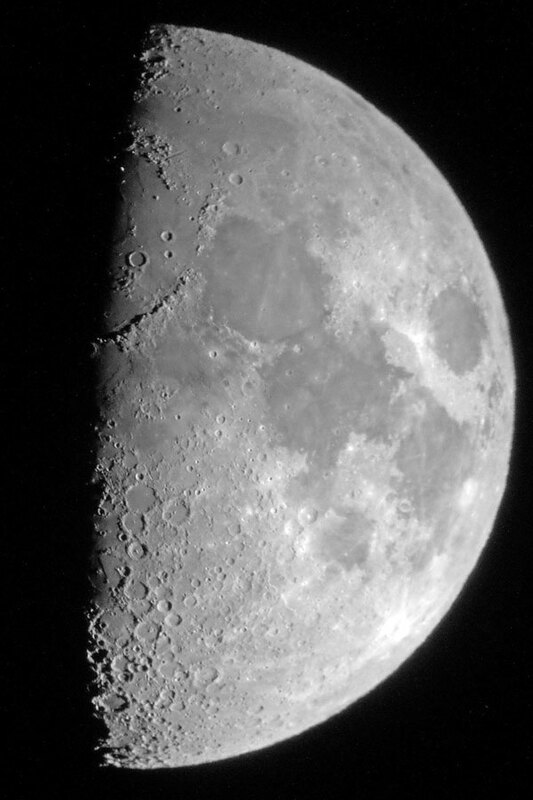 I used the Sky-Watcher Skymax-102 OTA and Skymax-127 OTA with a 32 mm eyepiece. 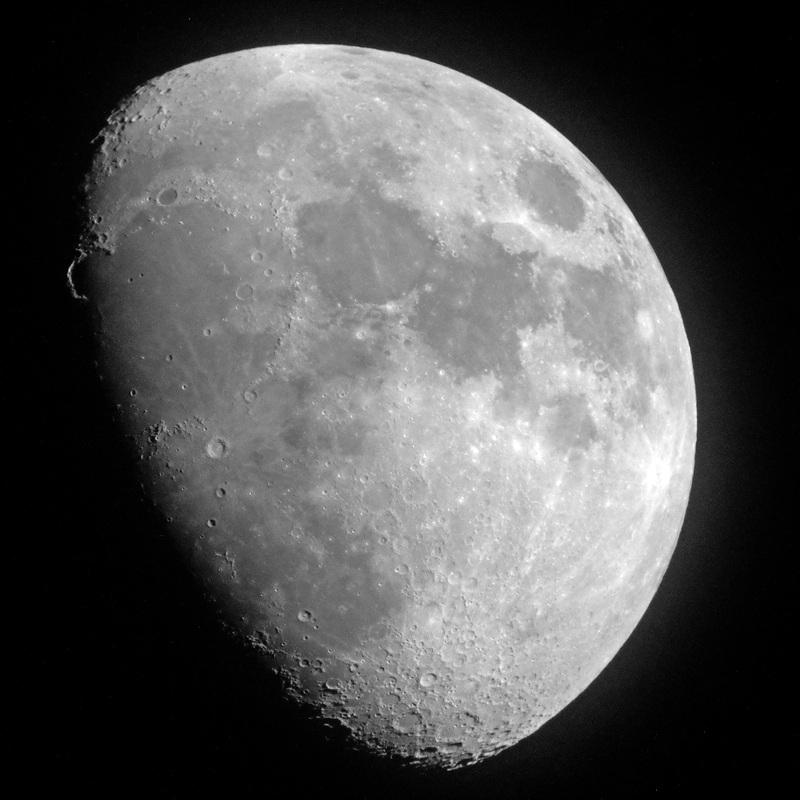 Since I did not document anything, I am no longer able to assign the photos to the telescope tubes.